Check out this gem I scooped for five bucks at Goodwill. It’s lack of appeal didn’t deter me from making the purchase. 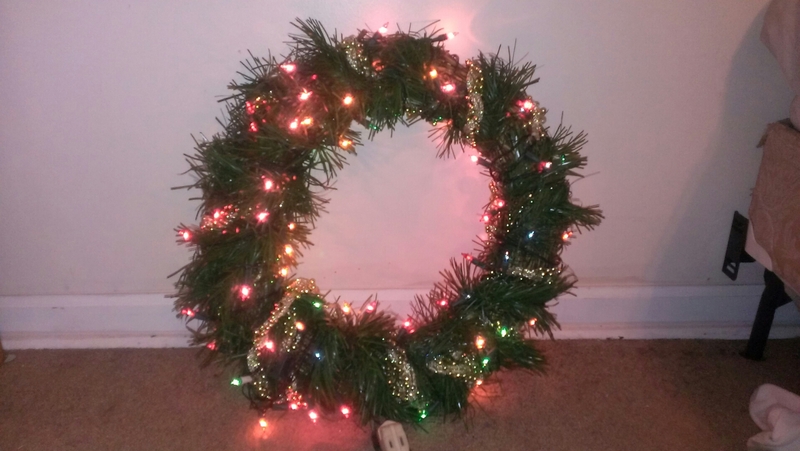 Underneath the tacky mesh material and outdated golds beads, the wreath beamed with potential. 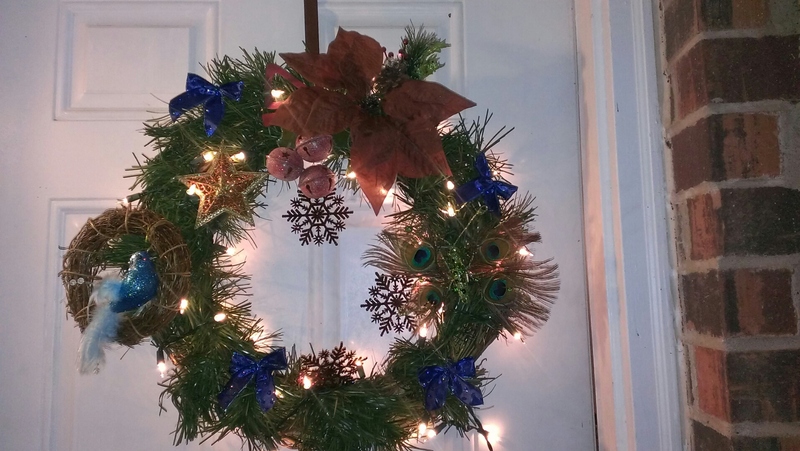 So how can you customize a wreath to accentuate your front porch? Determine what style you’re going for. Although we’re looking forward to a colorfully decorated Christmas tree, the outside of our house appears more reserved. We opted for white lights, snow flake tea light holders and a sophisticated, classy wreath with hipster touches (imagine birds and a peacock butterfly). I steered clear from red since navy blue sounded preferable, and I didn’t want a patriotic wreath. Instead, sparkling bronze hues paired with dark blue tones and white lights perfectly captured the rustic, yet modern feel I had hoped to create. To capture this look, first wrap the wreath in a string of white lights, then determine where the main decorative item will go. The poinsettia fit well towards the top right hand corner. Then place a piece of mistletoe behind the poinsettia. I found the small nest in the attic after purchasing the blue bird at Hobby Lobby. All it took was a hot glue gun to attach the bird to her roost. Afterwards, you can attach the nest to the wreath with a paper clip easily. The peacock butterfly came equipped with a clip on the back. If you want, clip the butterfly across from the nest as a way to “even out” the larger items towards the middle of the wreath. 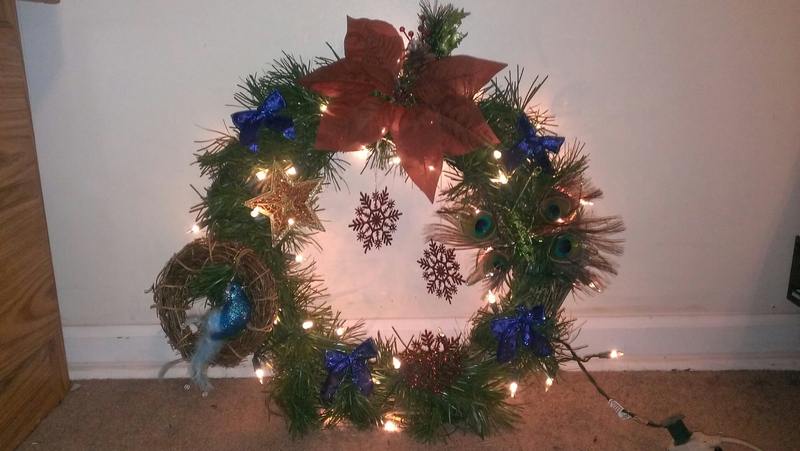 Next, take the royal blue bows to fill in space and sparingly twist a few bows into the wreath. Remember, less is more! Feel free to add a star ornament into your project if you have one. The sparkling brown snowflakes are available at Walmart. I added one at the bottom of the wreath. For the center of the wreath, I took twine to the flakes so they would hang in the middle. The string wraps around the wreath behind the large Poinsettia, allowing the flakes to fall in the center. If you have any questions about decorating a wreath, please feel free to speak up 🙂 This turned out to be a fun, easy project. I’m always in awe of people who can see potential in ‘nothing’ and create ‘something’. Love the end result!